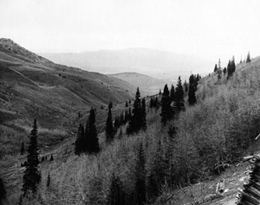 Thaynes Canyon is an upscale neighborhood within the Park City limits. Real estate in Thaynes Canyon is mainly single-family homes. This unique real estate neighborhood incorporates the hillsides behind the big white barn (McPolin Barn) that you see in pictures of Park City, and offers beautiful tree-lined streets and encompasses the wooded hillsides & rolling meadows below Park City Mountain. Thaynes Canyon stretches along the Park City Public Golf Course and gives easy access to the vast community trail system which converts to a well-groomed Nordic trail system in the winter. There are a few larger parcels that allow for horses. The area is easy to access off of Highway 224. Call Cindy Wallace, your local Park City Realtor, with over 23 years of experience at 435-901-2781 or email her at cindy@parkcity4u.com for professional representation. One of the most recognized and famous landmarks of Park City is the beautiful old white barn that looks like it was painted on a scenic pasture south of U-224. 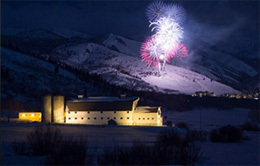 The barn which is featured in endless amounts of Park City photographs is known as the McPolin Barn. The Park City unofficial welcome sign and landmark was purchased by the Citizens of Park City in 1990 to safeguard and enhance the entry corridor of Park City and to preserve open space. The original Thaynes Canyon 160-acre farm was homesteaded in 1886 by the Harrison McLane family and acquired by Isabelle and Dan McPolin around 1900. In 1908 the McPolins built the barn of recycled timber salvaged from an old tailings Mill and by fitting timbers together without the use of nails. Patrick and Grace McPolin inherited the farm in 1923 and operated it as a dairy farm until they sold it to D. A. Osguthorpe, a Salt Lake veterinarian, in 1948. He increased the herd to 100 and built the milking parlor. The old house burned shortly after Osguthorpe purchased the farm. The present McPolin house is a somewhat smaller replica of the original structure, which was moved to this location in two pieces in the early 1920's, Prior to its relocation it served as a mine office. The farm house is 400 square feet. The reconstructed house is similar in outward appearance to the original Pyramid Cottage type house, which reflects early 20th century Park City real estate architecture. The barn is 7,468 square feet including the loft, and the milking parlor, added in the 1950's. The Farm has been extensively refurbished, including stabilizing the barn, to maintain it as the most significant visual feature of the valley and an entry corridor landmark. The country setting provides a haven from today's fast-paced life and welcomes residents and visitors to Park City. A hiking/skiing/biking trail is located along the upper edge of the property. represent the ultimate Park City Mountain Lifestyle!" CONTACT Cindy Wallace for thaynes canyon REAL ESTATE.